"You know, sometimes I wished my mother would have dressed me up funny so I could have grown up to be a homosexual." Recently released by Gorgon Video is a two-fer of classic exploitation films from the great Arthur Marks, who I was familiar with through such classic films as Detroit 9000, Bucktown, J.D. 's Revenge and Friday Foster. I wasn't sure what to expect since those films were more blaxploitation/urban than the two titles on this set, but I knew Marks was a good film maker and had to give them a shot. 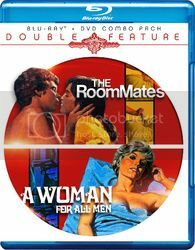 The films in question are 1973's The Roommates and 1975's A Woman for All Men. The Roommates is a classic story of a group of twenty-something girls who decide to go away together for the summer to Lake Arrowhead. Among the girls are sassy Carla (Sugar Hill herself Marki Bey), wild Beth (Big Birdcage's Roberta Collins), strong Heather (Petticoat Junction's Pat Woodell) and motherly Brea (The Hot Box's Laurie Rose). We follow these beautiful girls as they party and meet up with different men and each have their own adventures. Oh yeah, and just to make this film not your average seventies swingin' girl film, there is someone going around killing people at the lake too. A Woman for All Men stars Judith Brown (also from The Big Birdcage) as Karen, a Las Vegas prostitute who marries a rich older businessman (Keenan Wynn), much to the dismay of his children. One of his sons (played by Dirty Harry's Andrew Robinson) however falls for Karen and after his father disappears and is presumed dead, they run off only to realize things aren't really what they seem. Gorgon Video hits it out of the park with this sleazy duo of exploitation goodness. Arthur Marks proves himself a great film maker in any genre and with great stories, a who's who of classic 70s actors and lots of skin, what we have is a must buy DVD/Blu Ray combo. The Roommates, with its lovable cast of some of the sexiest girls in film at the time, witty script and proto-slasher side plot was definitely the stronger of the two. A Woman for All Men was a nice lurid tale with the beautiful Brown and menacing Robinson holding it all together but suffered slightly by its almost Soap Opera moments. Gorgon's presentation here is top notch with amazing looking transfers and a bunch of worthy bonus features (including on screen interviews with Marks, Brown and Roberta Collins).